Why Should You Learn Math? 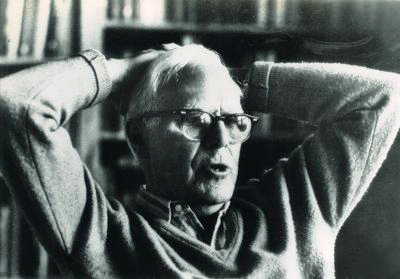 Martin Gardner. Image: Konrad Jacobs, Erlangen, via Wikimedia Commons. People often ask why they should learn maths, what is it good for, or what is its practical purpose. Many seem to think of literature, film, or history differently. People see these things enhancing their lives everyday when they get a reference, or can recite an interesting fact to friends. They get a bit of delight when they understand the phrase tilting at windmills, when they can recite some shakespeare to a loved one, or when they make friends laugh at an anecdote about Emperor Norton I. They don’t realize that knowledge about maths can enrich their lives in similar ways. Maths can be enjoyed in many aspects of life, such as understanding the jokes in the simpsons, understanding the origins of some idioms, recognizing absurd laws, and enjoying different kinds of puzzles and games. The Simpsons is chock-full of maths jokes and references. In the episode “The Wizard of Evergreen Terrace” Homer Simpson models himself after Thomas Edison. On a blackboard seen in the episode is the equation 398712 + 436512 = 447212 (“The Wizard of Evergreen Terrace”). This is a joke about Fermat’s Last Theorem. Fermat’s Last Theorem says that there are no integer solutions to the equation an + bn = cn when n is an integer greater than 2. The equation on the board seems to contradict this if you plug it into a calculator. This is because your calculator may not remember all the digits of the numbers as it calculates them. The numbers on the board were picked by the writers as a joke to look like Homer had found a counterexample to FLT. In the episode “Treehouse of Horrors VI”, Homer is pulled into the third dimension and runs into several maths references. These include another false counterexample to Fermat’s Last Theorem, the statement P=NP, and euler’s identity, eπi= -1 (“Treehouse of Horrors VI”). There are many other references in The Simpsons and its sister show Futurama. These jokes and references come from the mathematicians who are working as writers on these shows. The writers enjoy maths, and they can see that it can also be funny. Mathematics sometimes even enters everyday speech. If you have ever heard someone say something like “Your expectations do not square with reality” or “That is as hard as squaring the circle” you know some idioms based on mathematics. These phrases come from the ancient problem of squaring the circle. The problem is trying to construct a square with the same area of a circle using only a straightedge and compass. The first reference of the problem is from plutarch. He claimed that when Anaxagoras was imprisoned he spent his time trying to construct a square with the same area as a circle (Boyer 57). This problem persisted for thousands of years until, in 1882, it was proved to be impossible. The impossibility to square the circle was not known to Edwin J. Goodwin, a physician from a small Indiana town. Goodwin thought that he came up with a proof that he could square the circle, but it depended on the ratio of the circumference of a circle to its diameter to be 3.2 (Singh 24). You might be aware (and if you are reading this blog you probably are aware) that the ratio of the circumference of a circle to its diameter is equal to π, an incommensurable number. In 1897, Goodwin proposed a bill to the Indiana General Assembly to legislate the value of π. He offered to let the schools in Indiana use his “Discovery” for free, and he offered to split the royalties from it with the state. Sadly, the Indiana House of Representatives members did not understand the mathematics in the bill and passed it (Singh 25). Luckily, when it got to the state senate there was a mathematician in the building. The head of the Purdue University Mathematics Department, C. A. Waldo, saw the bill and explained the absurdity of it to the legislators. After their brief lesson from Waldo, the state senators mocked the bill and did not pass it (Singh 25). Mathematics can also provide a great deal of casual fun in the form of games and puzzles. Martin Gardner’s column, Mathematical Games, in Scientific American introduced people to interesting things based on mathematics. The column contained information about a variety of topics, including Graham’s Number, Hexaflexagons, and on April Fools in 1975 it contained a false counterexample to the Four Color Theorem. Today, many people play video and board games that are complicated enough that knowing some mathematics will allow you to enjoy the game on more levels. Minecraft is well known for allowing players to express their creativity and build whatever they would like. In the game, the item redstone works like a circuit. Redstone has 2 states, on and off, and can be used to make logic gates. This lets players learn about boolean logic while they are trying to construct their crazy contraptions. In strategy games, like Twilight Imperium or Risk, understanding the basics of probability is vital. You need to understand how the dice are going to behave to know when you have the advantage or your opponent has it. Should you attack twice with each attack having a low chance to succeed, or should you attack only once with a much better chance to succeed? Should you buy the technology that increases damage with each hit or the one that gives a better chance to hit? These kinds of questions come up all the time and can be answered by analyzing them mathematically. Everyone knows that mathematics is useful for practical purposes. We know that the sciences rely heavily on mathematics, that we should understand how interest works if we take out a loan, and that there are many other places that require maths in a practical way. However, many people do not see that a little understanding of mathematics can expand their world in countless ways. Mathematics is far more than just playing with numbers or a tool to help physicists. Mathematics can be a way to understand a joke, it can help you play a game, or it can help you understand those around you. Singh, Simon. The Simpsons and Their Mathematical Secrets. New York: Bloomsbury Publishing Plc, 2013. Print. “The Wizard of Evergreen Terrace” The Simpsons. Fox. KVVU-TV, Henderson. 20 Sep. 1998. Television. ““Treehouse of Horrors VI”” The Simpsons. Fox. KVVU-TV, Henderson. 29 Oct. 1995. Television. This entry was posted in Big Problems and tagged fun, martin gardner, The Simpsons on December 18, 2014 by timothyschelz. When you read and watch a lot of bad science fiction, like myself, you get used to a lot of cliches and sci fi tropes. The heroes will obviously have to travel through time, fight their doubles, and outsmart a supercomputer. Despite their predictability, and no matter how far-fetched they are, I almost always love them. The one thing I can not stand, though, is when writers use words incorrectly in order to make things sound “cool” and “sciency”. Things like cosmic rays to explain the fantastic 4’s powers, any time quantum mechanics is brought up in fiction, and people saying infinite when they simply mean unimaginably large. The worst one, though, is the misuse of the word dimensions. 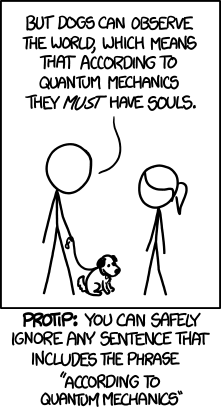 Quantum Mechanics image: Randall Munroe. A dimension is not an alternate reality where everyone is evil and has facial hair. Dimensions are properties of space that we can use to denote position. A square and a circle have 2 dimensions, but a cube and a sphere have 3. This is similar to how most movies are portrayed on a flat screen, but when watching 3-D movies you can put on special glasses and they suddenly have depth along with length and width. This can go beyond 3 into 4, or 5, or n dimensions. Movies and pop culture often shows its ignorance in many different dimensions. You may have seen one of the many Marvel superhero movies featuring The Tesseract as a Macguffin. A tesseract is the 4-dimensional version of a cube, just like how a cube is the 3-dimensional version of a square. However, The Tesseract in the movies just appears as a blue glowing cube with magic powers. It isn’t shown to have any properties unique to a real tesseract, or hypercube. In the episode “Through the Looking Glass” of the TV show Farscape, the characters are separated into different colored dimensions. Here dimensions are treated as if they are different universes each with a different color and a different effect on peoples senses. Countless other tv shows, movies, games, and pulp novels provide just as poor and worse depictions of dimensions. A rotating tesseract by Jason Hise. In defense of these creators, thinking about 4-dimensional and higher objects can be difficult. One way to help our imaginations is to think about going from 0 dimensions to 1 dimension to 2 dimensions and then up to 3 dimensions. If we start with a point and stretch it some length we get a line, then if we stretch the line the same length we get a square, then if we stretch the square out we get a cube. We can extend this to higher dimensions. If we stretch the cube out into the fourth dimension we get a hypercube or tesseract. If we want to think of a 4-dimensional ball coming into our 3-dimensional space, we can similarly think of an analogy in lower dimensions. You can imagine a ball dropping through the surface of a pool of water. In this case, the ball is a 3-dimensional sphere going through the 2-dimensional plane of the water’s surface. As the ball first touches the surface, a small solid circle would suddenly appear. Then as the ball starts sinking down, the circle would grow and grow until it got half way in the water. Once it passed the halfway mark, it would start shrinking until it was just a tiny circle and finally disappear. Something similar would happen with a 4-dimensional sphere appearing in our 3-dimensional world. It would appear as a small sphere, grow until it got halfway, and then start shrinking until it disappeared. Basic geometric shapes are the easiest things to imagine in higher dimensions, because of all the symmetries they have. When you want to think about more complicated things, you need a way to represent the fourth dimension. When we thought about the 4-dimensional sphere, we used time as the fourth dimension. As time advanced the sphere passed through our space so that we could see its facets. However, if we wanted to play a 4-dimensional version of chess time may not be the most useful method to think of the fourth dimension. A regular chessboard is already 2-dimensional. We can then stack the boards on top of each other to get a 3-dimensional box to play in. If we want to extend the game further we need a way to represent the next dimension. If we get 8 separate 3-dimensional game boxes each one can be treated as a different level in the the next dimension. If we wanted to actually play chess we would also need a set of rules that work in higher dimensions, like this version. Thinking of these higher dimensions may seem like it is only a fun exercise for your imagination, but they are meaningful and have some applications. Einstein’s theory of special relativity combines the 3 spatial dimensions we live in with time to form Minkowski Space (Devlin 322). This allows physicists to think geometrically about space and time. Higher dimensions also comes up when looking at some higher mathematical ideas, like algebraic curves. Graham’s number, one of the largest numbers ever used in a scientific paper, comes about when looking at cubes of n dimensions. In 1868, Julius Plucker created a new type of geometry that doesn’t think of space as a bunch of points but rather as an infinite number of lines. In this new line geometry, our normal 3-dimensional space made up of dots becomes an infinite amount of lines defined by 4 parameters (Boyer 498). Thinking of higher dimensions can be a useful tool to help us analyze the world around us. Not every work of fiction fumbles over depictions of different dimensions. There are several examples of TV shows, games, and books accurately depicting higher and lower dimensions. Futurama and The Simpsons are known for their many accurate references to mathematical ideas. In “Treehouse of Horror IV”, Homer stumbles on the third dimension and becomes a computer generated 3-D version of himself. In the Futurama episode “2-D Blacktop”, the Professor, Leela, Bender, and Fry end up smashed into 2-D versions of themselves with all the restrictions that brings with it. When they start expanding back into 3-D, the characters are seen travelling amongst fractals, which have fractional dimensions. The indie video game FEZ is about a creature who has experienced life in 2 dimensions being introduced to the third dimension by a 4-dimensional being. Many of the game’s puzzles revolve around treating the 3-dimensional world as a 2-dimensional projection. There is also the book Flatland by Edwin A. Abbott, which describes a square’s adventures to higher and lower dimensions. All of these provide accurate representations of what dimensions are and what living in higher and lower dimensions would be like. Higher dimensions are an abstruse but interesting concept. This idea can be used as a tool to help with mathematics and physics, or as something fun to just spice up an old board game. There is plenty of depth to the fourth and higher dimensions to write and create interesting sci fi stories. These stories can be interesting, consistent, and can go beyond just using the word dimension as a way to sound more “sciency”. Devlin, Keith. The Language of Mathematics: Making the Invisible Visible. New York, NY: W.H. Freeman and Company, 1998. Print. This entry was posted in Uncategorized and tagged 2D, 3D, 4D, Chess, colors, Dimensions, Fantastic Four, Farscape, FEZ, Futurama, Graham's Number, hypercube, Marvel, Minkowski Space, nD, tesseract, The Avenger, The Simpsons, Video games on November 3, 2014 by timothyschelz.